The fourth largest city of Morocco, Rabat is also the country’s capital, located by the Atlantic Ocean. The city lies by the shores of the Bou Regreg and is one of the easier going communities in Morocco. Compared to the bustling town of Casablanca which is located at a short distance from Rabat, the town’s environment is essentially laid back and provides a refuge from the busy Moroccan cities like Marrakech, Fez and Essaouira etc. Being located by the Atlantic Ocean, the city enjoys a mildly warm climate with warm summers and cool winters. The city’s history is deeply rooted in the Islamic culture with a distinctive architecture and cuisine, signatory of the Moroccan culture. Let us take a look at some of the most interesting places in Rabat. Located in the Yacoud-al-Mansour, the Masoleum of Mohammad V is one of the most visited attractions in Rabat. The mausoleum is the tomb of the Moroccan King Hassan II and his son Prince Abdallah. The building exhibits a remarkable architecture that is a signature style of the Alaouite Dynasty buildings and has a white colored structure with a green tiled roof which is considered a holy color in Islam. Oudaias Museum is located in the historic centre of Rabat, and was built around the 17th century by Moulay Ismail as his residence and is now occupied by a historical museum. The building of the museum is again, exemplary of the Alaouite architecture and is surrounded by huge gardens which were built in the 20th century. The room containing the artifacts is located by the end of the lodge and is reminiscent of a typical Moroccan building. The museum itself contains a verity of interesting objects such as pottery, books, jewellery and several types of Moorish musical instruments. Exhibiting a striking Andalusian architecture, the Medina was built by the Muslims who arrived from Spain in the 17th century. This alone makes the place very different from the medinas located in the other Moroccan cities like Marrakech and Fez. The Medina is also home to two of the best shopping locations in Rabat, namely Souk es Sebbat and Rue Souka. The town itself is home to several historical buildings and monuments including places like Merinid Fountain and the Koubba Mosque with a Jewish flea market located by the Mellah in the southeastern corner of the old town. The Kasbah is indeed one of the major reasons why tourists visit the town of Rabat. The Kasbah or the Kasbah of the Oudaias is an 11th century fortress built during the reign of the Almohads who captured Rabat. A mosque and a residential palace were later added to the fortress. The Kasbah was deserted after the decline of the Almohads after the death of Yaquib-al-Mansur. Today the walls of the Kasbah remain one of the most visited tourist places in Rabat and are also a part of the UNESCO World Heritage sites. Medersa is basically an Islamic school and the Abul Hassan Medersa was built by Sultan Abu-al-Hasan ibn Uthman around the early 14th century. Located in the ancient city of Salé, the school remains one of the masterpieces of the Hispanic-Moorish architecture under the Merinides. The floors are decorated with glazed ceramic pieces also known as zelliges with cedar-wood walls which are ornate with plaster and carved wood. The structure is divided into various levels with a prayer hall, fountain, student rooms, and decorated doorways. The construction of the Hassan tower began around the late 12th century and was supposed to be the tallest minaret in the world. However, the construction stopped soon after the death of the Sultan and only reached a height of 44 meters compared to the intended height of 86 meters. The structure was left abandoned and even the mosque couldn’t be completed. There also remain several walls and unfinished columns which were made in red sandstone. It was also added to the list of UNESCO World Heritage sites across the world in 1995. 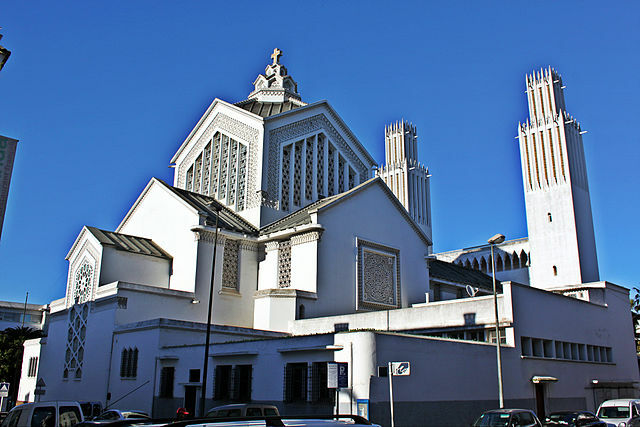 Known for its striking art deco architecture, Saint-Pierre cathedral is a Roman catholic church located in Rabat. The two towers of the church form an important part of Rabat’s skyline and is also the seat of the archdiocese of Rabat. The construction of the church began in 1919 with several additions made till the late 1930s including the signature twin towers. Being an administrative district in Morocco, Rabat isn’t what one can call a shopper’s fantasy. However, the city is more known for its rich culture and historic places. Make sure you visit the abovementioned places to get the best out of the coastal city of Rabat.